Don’t be surprised if the term South West Africa sounds more familiar to you than Namibia. It just means you were born before 1990 when the country gained independence and changed its name. As a geographical expression, South West Africa is fairly accurate because it describes the location of one of the world’s oldest and largest deserts – the Namib (from which Namibia gets its name). Over 80,000 square kilometres of rugged mountains, arid plains and shifting sand dunes that change colour, from red to yellow, and extend as far as the eye can see – like landscapes on the moon. 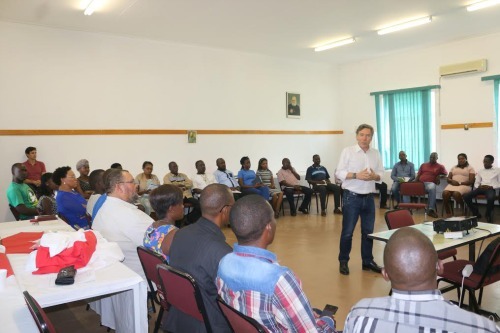 Imagine crossing that desert by car (without air-conditioning) to attend a Communications Workshop, organized by CREC and the Namibian Bishops’ Conference, outside the capital city of Windhoek. Because that’s exactly what many of the 40 participants did. They came from all over the country in response to an invitation, and in reaction to a challenge, to: “Discover, Experience and Create”. The groundwork was laid by Fr Veranus Shiimi, the person responsible for media and communications for the Bishops’ Conference (and a former student of mine at the Pontifical Gregorian University in Rome), and his assistant, Sr Scholastica Kaliki. With the help of local bishops, priests and religious, they identified the most promising Catholic communicators in the country and brought them together under one roof for a unique CREC Experience aimed at unleashing their creative talents and skills. In the words of the participants themselves, that Experience was “inspiring”, “liberating” and “life-changing”. Thanks to the inventive energy of two new CREC trainers, Tim Harris and Sean Lategan (who also produced the must-see video), everyone went away feeling encouraged and motivated by the knowledge that media is so much more than technology. It’s relationships. You can be sure that, because of the relationships that were born and nourished during the CREC Workshop, communications in Namibia will never be the same again.